Ladders are simple tools that are used in many occupations and in completing household repairs, yet in even their simplicity, they can cause many injuries. In a 16- year study of ladder injuries requiring medical attention, the Center for Injury Research and Policy in Columbus, Ohio, the study group found that there was an average of 136,118 ladder injury cases each year, increasing 50% over the study period. Even though ladders have been used for hundreds of years, there are still many dangers both in how they are used and in how they are made and maintained. The facts derived from the study show that both not adhering to safety measures and poor ladder construction had major impacts on injuries occurring on the job. Choose the right ladder for the job. Make sure it is the right height and has the correct weight capacity. Never use a metal ladder near electrical lines. Make sure the ladder has enough height and is capable of bearing the correct load. Inspect the ladder before use. Look for damaged or missing rungs, cracks, dents, missing screws or anything that looks worn or broken. There may be defects on even a new ladder or they may happen over time from use. Set up a leaning ladder on a dry, flat surface. The top of the ladder should extend at least 3’ beyond the top of the wall. Make sure it is not near a door. Have the bottom of the ladder secured and mount the ladder from the center. Use two hands to climb and at least one on the ladder while you are working. These injuries can require extensive medical treatment and even long-term disabilities in some cases, making it difficult for workers to return to their jobs. The injuries can result in financial hardship and strain on the worker and their family. When an injury happens when working on a ladder, there is a great risk of serious injury. 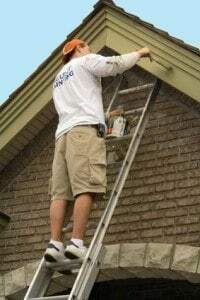 For those who have been hurt from a ladder injury on the job or due to a defective ladder, you may need legal advice to ensure that you receive compensation from those legally responsible either in a form of a lawsuit against the owner of the ladder, a workers compensation case or a product liability claim against the manufacturer. Rosenfeld Injury Lawyers LLC are experts at both work injury and product liability law and can advise you on what are your best options for the most significant financial recovery. We invite you to call our office for a free consultation to discuss your case to talk with an attorney who has experience litigating accidents involving falls from ladders or defective ladders. Rosenfeld Injury Lawyers LLC represents people injured in accidents involving recalled and defective ladders. You can view our practice page on ladder defects here. For up-to-date information on recalls of ladders, view our page here.